A great basic cover lifter, the ProLift attaches to both cover and cabinet and has a built-in safety lock feature. Just lift, glide and fold away. Requires 14” clearance. Similar in design to the ProLift III, the ProLift II uses a single pneumatic gas shock lifter for smooth operation. Requires 24” clearance. The sturdy ProLift III lifter has two pneumatic gas shock absorbers to provide smooth, quiet operation. Springs do the heavy lifting, so that very little effort is required to lift or replace the cover, even on larger spa models. Requires 24” clearance. 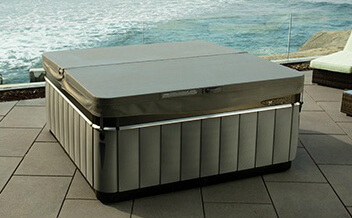 For hot tub decks, gazebos or other areas where clearance is limited, the ProLift IV allows you to position the cover vertically, just behind the spa. Requires only 7” clearance.